display. It incorporates all the features of the larger MM104LP, including the race computer and software, plus it can be used to calibrate, set up and control a complete Sailmon instrument system. Mounted at a helm console or nav station and integrated with other Sailmon devices on larger yachts or installed in the cockpit of smaller racing boats and used independently, the RI70W also incorporates an integral WiFi access point, very useful when using WiFi enabled devices on deck or for extending the WiFi system on a carbon boat. The RI70W uses the already well-known high quality, ultra-bright sunlight readable 7″ widescreen display, incorporating the very latest anti-reflective technology and has a reliable saltwater-proof touchscreen for easy use by helmsman or crew. The unit has a completely flat face and is enclosed in a rugged, waterproof (IP67), black anodised, marine grade aluminium box – perfect for both easy and stylishly good looking installations, above or below deck. The RI70W opens up a vast range of new possibilities for a racing yacht. Like all the Sailmon Instruments, the RI70W is completely configurable. 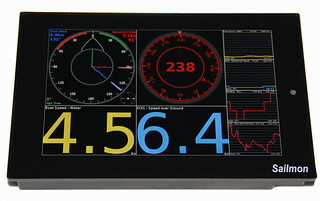 The yacht’s navigation and performance data can be displayed in a choice of either analogue, digital or graphical format. The RI70W comes with an integral race-processor and grand-prix level software. All the data input is processed on board the Sailmon instrument. Interoperability with most major instrument systems is made possible via the S-Box which has B&G Fastnet, SeaTalk, NMEA 0183, and NMEA 2000 interfaces. The S-Box also provides a high power WiFi access point for iPad control, tablets etc. This combined with the Power Line Communication System which uses the yachts power cables to transmit and receive data, makes for simple and low cost retrospective installations. Power consumption using a 12V or 24V battery feed is 7W maximum and 6W average.